Welcome to JOLI Holidays ! 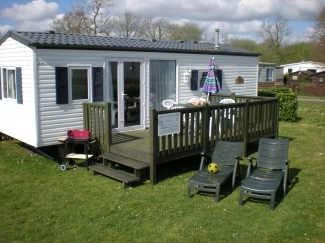 we have 6 berth moble homes at the lovely, family run, La Mer Blanche Campsite in Benodet. The campsite is owned by a very friedly french family, who will do all they can to make you feel welcome. It's very popular and has lots to offer with an onsite *heated swimming pool, heated kids splash pool, slides pool, table-tennis, bouncy castles, swings, slides, climbing frame, play areas, bar, restaurant, shop, take-away, laundry and reception. *(pools are open mid June to mid September). Our homes are very new and modern and equipped to a very high standard, there are two bedrooms, one double and one twin both with wardrobes, overhead storage and bedside cabinets, plus a double sofa bed in the open-plan living area. Cot space is provided in two of our 6 berth homes. The kitchen is equipped with all you should possibly need including a combi microwave, gas hob, electric kettle and toaster, plenty of dishes, glasses, cutlery, pans etc. There is a fixed smoke alarm and fire extinguisher for your complete safety. You will find a good sized shower with vanity unit and storage. The toilet is separate for privacy and convenience. Outside you have your own private garden area and a furnished decked patio, complete with outdoor table, chairs, sun-loungers, parasol and bbq. There is plenty of space to park your car. La Mer Blanche is about a 10 minute walk to the nearest sandy beach. The centre of Benodet is about a 5 minute drive where you will find another beautiful beach and promenade shops, bars and restaurants. Fouesnant, a pretty typical french village, is also just a short drive away. Again there is a sheltered beach here with a few shops, bars, restaurants and an 18 hole golf course. The nearest city is Quimper, which is a lovely medeival city with plenty of shops, bars and restaurants all housed in original half timbered Tudor buildings, lining ancient cobbled streets. Quimper is approximately a 15 minute drive away. Our homes provide an ideal base for exploring the surrounding area of Brittany. You will find a zoo, theme park, marine life centre, beaches both sandy and rocky, markets, shops, bars, restaurants, ancient villages, modern cities, bowling alley, museums, churches, cathedrals, indoor pool, plus lots, lots more. We're sure that no matter what your interests, you'll have fun finding all you enjoy in this beautiful part of France. All our customers benefit from DISCOUNTED ferry fares with most major channel ferry companies, ie Brittany Ferries, P&O, Condor etc. Security deposits of �75.00 GBP are always taken in the interest of our holidaymakers only, but we have never yet had cause to retain any of this money, all deposits have been refunded to date. OFFER: Book any 7 nights between 23rd May 09 and 13th June 09 for just �250.00 or any 14 nights for �495.00. (Subject to availability). 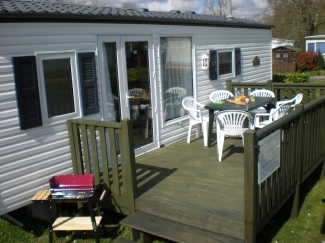 For details of our 8 berth home at L'Orangerie De Lanniron, Quimper, please visit our website, thank you.